This furry little critter resembles a real mouse in size and appearance. It has cute, playful pink ears and whiskers. When turned on, its soft rubber tail wiggles back and forth as it scampers and scurries along, calling the attention of nearby cats. This pet activated robotic toy plays an engaging game of cat-and-mouse, lying dormant and waking up with the swat of a paw. There are two different modes of operation - "paw mode" designed for the more docile cat, and "chase mode" designed for more active cats or kittens. WARNING: Remove toy from pet if any part becomes loose, damaged or detached. Intended for pets only. Not a children's toy. 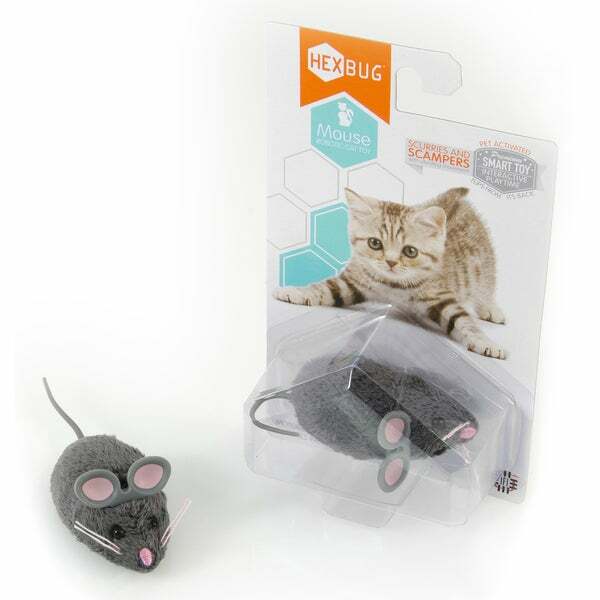 Pets should be supervised when playing with this or any other toy. Do not allow any pet to eat this toy.